The AM3450a by AirFoxx is a multi-purpose air mover designed for the toughest of jobs. It offers a 3/4 HP motor that delivers up to 3450 CFM (at 120V, 11 amps) and its high impact resistant body ensure durability. Its 3 way position capability (0°, 45°, 90°) allows for easy setup for any job. This machine is ideal for any clean-up, janitorial, office maintenance, and restoration projects. Dimensions are 20.7 x17.2 x19.5 . 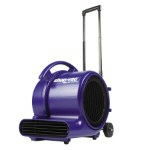 * Questions on our carpet dry fan rentals? Please call us!